How large are your grants? Grants typically range from $20,000 – $100,000 per year in order to maximize impact to the community. Awards will be no more than 10% of an organization’s current fiscal year’s operating expenses or previous fiscal year’s contributed revenues (excluding in-kinds), whichever of the two amounts is less. Program Grants (Transom and Cultures of Compassion Grants) will not exceed $40,000. Currently, the average grant award is around $40,000. Smaller requests ($20,000 and under) should come through the Small Grant Program. How do I reserve a meeting room at The Trust? What doesn't The Trust fund? How do I register for a Healing for the Healer retreat? Do you give multi-year grants? With the exception of multi-year Advocacy Grants, awards are granted on a year-to-year basis. Applicants may submit two grant applications within a twelve month period. Organizations will typically only receive one grant of a specific type per year. Click here to see which types of grants you can have at the same time. Grant proposals will be accepted and reviewed on a quarterly basis. Applicants are allowed to apply only twice per year (e.g., if an applicant is not awarded a grant the first time that they apply, they may make one more application attempt within a 12 month period.) Applicants cannot have more than one transom grant concurrently or a transom and an operating grant concurrently. All proposals are due by 4 PM on the day of the deadline. Grant deadlines are available here. The grant policies, guidelines, programs, application requirements, and funding decisions are the responsibility of the Board of Trust. These items may be modified by the Board of Trust at any time in its sole discretion. Why are there two stages in the application process? The process includes two stages to keep you from wasting time writing a lengthy application for a program that we are not likely to fund. I missed the deadline. Can I still submit my application? To be fair to the other applicants, we will not accept applications after the deadline. You will have to apply in the next cycle. Does The Trust offer extensions? The Trust provides no-cost extensions in some instances. Please call your program officer to discuss your specific circumstance. Please note that an extension will not be offered after a grant term has ended. How do I know what quarter I’m in? Locate the grant term start date in either your award notification email or your award agreement/memorandum of understanding (MOU). The grant term start date will be January 1st , April 1st , July 1st , or October 1st . Review the grant cycle deadlines for each quarter and find the quarter that corresponds to your grant term start date. You will need to apply based on the deadlines that align with that quarter. If you are still unclear, call your program staff member and they will look that information up for you. What should I do if a staff person that The Trust funds leaves the organization? Please call us if this happens. We may be able to provide a no-cost extension to give the agency time to fill the position. What should I do if my agency receives negative publicity? Please call us if you anticipate receiving negative publicity or unexpectedly receive negative publicity. We would prefer to hear the news from you rather than the media. Can I change my outcomes or reallocate funding after a proposal has been funded? It’s possible. You can formally request to revise your outcomes/reallocate funds in the progress report or you can call your program officer to discuss a revision/reallocation at any point during the grant term. Please note that a revision/reallocation cannot occur after a grant term has ended. Site visits typically last an hour and include a tour of the facility (if appropriate) and the opportunity to ask questions about the organization and program being funded. The site visit is not an audit and should not interrupt the organization’s normal operations. The Trust’s staff and board members visit all grantees bi-annually and new grantees in the first year of Trust funding. When will I find out if my application will be awarded or declined? We will notify you within 8-10 weeks from the deadline of the full proposal. How often do we have to submit reports? All grant recipients are required to submit a final report. Please note that Transom, Cultures of Compassion, and Advocacy Planning grantees are also required to submit a mid-term progress report. I started a report/application and now it is missing. Where did it go? 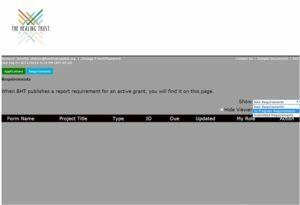 It is very likely that your report/application has moved from “new requirements” to “in progress requirements.” You will likely find your report under the “in progress requirements drop down menu. How many years of operating experience must an agency have before applying? An agency must have been in operation as a 501(c)(3) for at least one year. What happens if my grant is declined? Please schedule a phone call with a member of the Program Team to receive feedback on your declined application. Applicants may submit two grant applications within a twelve month period.